STAND AND DELIVER LIKE A WARRIOR! The headline above "Stand and Deliver", was the headline in the Bergen Record today, written by Steve Popper. I added the "Warrior" part because... I make my own headlines here at BYB. Popper wrote a good piece today on last night's game, read HERE. I was half awake cracking open the paper this morning, ready to read Pete Caldera... then I realized that Caldera was doing his best Frank Sinatra at the Carnegie Club last night.... read CALDERA-PALOOZA! Popper will do... I like him too! He did a great job writing phrases to pump me up, like, "If the sense of urgency didn’t show before the game, it was evident once they took the field" and "The Yankees began this crucial homestand knowing it could be a last stand". All of this is true. But now the reality could be so painful to us Yankee fans, that if we root alittle harder, but lose... the disappointment will be a lot worse. Look, we were handed a team that none of us were very fond of this season, but we rolled the dice with Cashman and the boys and hoped things worked out. Vernon Wells and Travis Hafner haven't exactly been outstanding, which is why it's now crystal clear to me why the Angels unloaded Wells in the first place. No one has a crystal ball, but he was traded for a reason. We now know what that reason may be. The injuries have killed us too. The injuries have crippled us all season and while that's no excuse... it's a major blow. True, 25 players make a team, but the 25 we have, and it's been a revolving door, have not been the "best team on the field" as Hal Steinbrenner has told us. We know this... but we need to live with it and root for the team. That's all we can do. But something big happened last night. The Yankees fought. They fought like warriors. They knew their backs were against the wall and the had a come from behind win! CC Sabathia was down and they picked him up. As CC said, "Unbelievable... That’s what I always talk about. If I can keep these guys in the game, we’ve got a good chance of winning. I was barely hanging on there but these guys come up with a bunch of runs.” It's true. We CAN accomplish anything, but we need to have a chance. 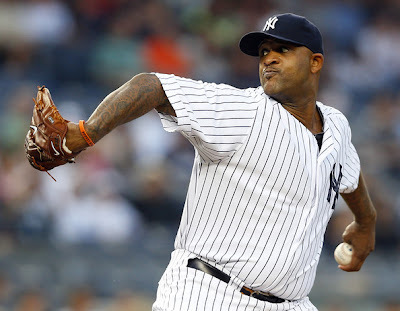 Now, don't rank on CC Sabathia. Chalk up this season as a lousy one. Every great pitcher is entitled to 1. This is his year. Now, that theory isn't exactly popular, I get that. I mean after all, big game pitchers HAVE to deliver, but I cut CC some slack. I just hope he can figure out whatever has happened and get back into being dominant again. I trust he will. 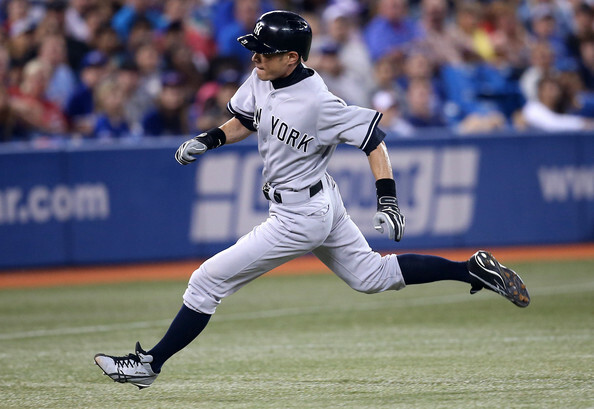 The Yankees have a long, long way to go and they're running out of time this year. Is it possible that they can make the playoffs? Yes. Will they? It's tough to say, but I will say this... if they play every game like it's their last, or like they played last night... we DO have a chance. We all know the talent is there. 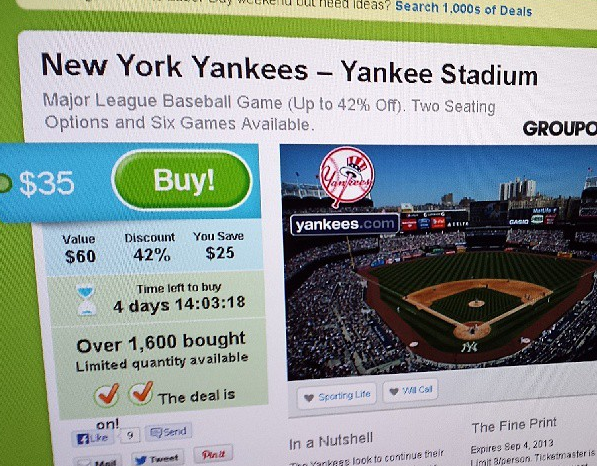 Yankee fans are spoiled. We expect to win. That's just the way it's supposed to be. If the Yankees don't win... there is something wrong in the universe. So, we come to the ballpark ready for big things. We come to the ballpark wearing our #2 or #46 jersey. We spend big money on tickets and bring our families and spend hundreds of dollars to see our team win. Why? Because we're Super fans... we're Yankee fans and losing isn't an option. 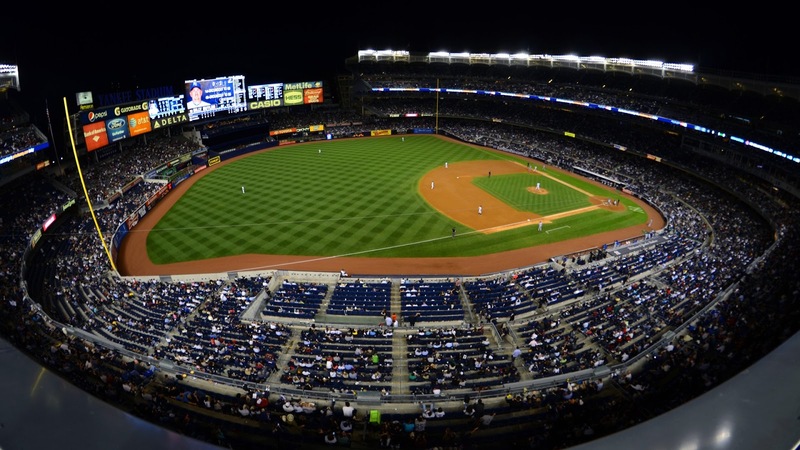 You have that mentality in life, so why not have it in Yankee Stadium? It makes perfect sense to me. Last night big things happened. 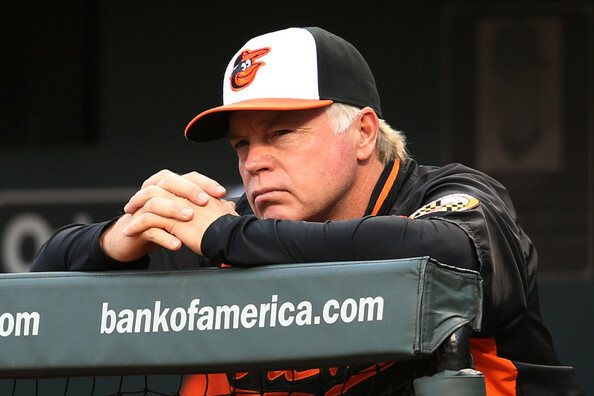 This morning, no one is more angry than Buck Showalter who wants revenge. So, what do we do as a team? We keep stomping on the O's. We keep fighting because now it doesn't matter what team it is we need to beat. We need to beat ALL the teams that get in our way. But one thing is important to understand in this whole scenario... Buck Showalter does NOT roll over. Today will be tougher than yesterday. Sunday will be tougher than Saturday... and the competition, be it the Royals, the Orioles or the Red Sox should be a faceless enemy right now. We should walk on the field as warriors... the same mentality... the same ferocity, the same animal instincts for ANY team we fight. 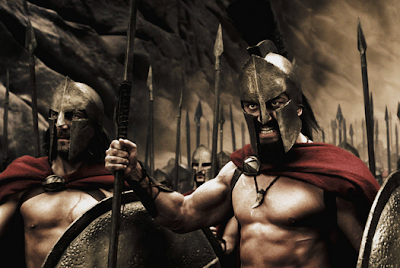 They are the enemy, we need to beat them... at all costs... that's the Yankee way... that's always been our mission. Let's do this gentlemen... let's do it now! A friend of mine posted a picture of herself sitting happily on the Budweiser Roof Deck in Fenway Park and I immediately got ballpark envy. 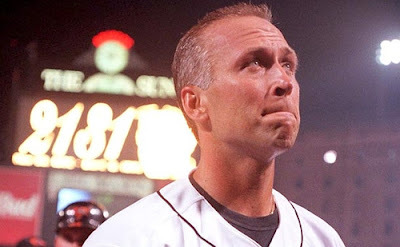 Kenny Chesney recorded a song this summer called “When I See This Bar” and one of the lines that I just love is “Pieces of my past slowly slip away, but time just stands still when I walk in this place.” That’s how I feel about ballparks. They carry with them memories and feelings of games, players and family. They are monuments to the games and records set over the years. They are our living rooms, dining rooms and kitchens. They are our homes, they are our fields of dreams, and they witness the magic of the games of yesterday, today and tomorrow. 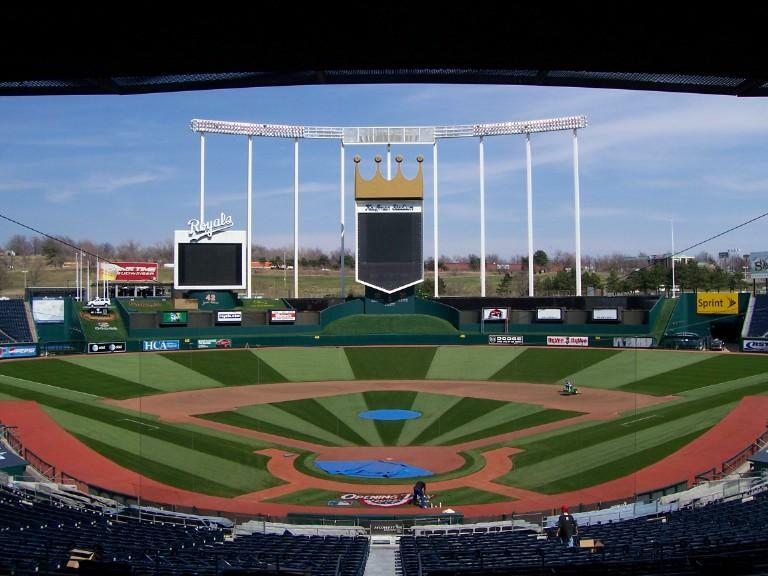 You see, ballparks have their own attitudes, their own personalities and their own special flare. And they are all on display for the spectator who walks through the tunnel that leads to the green fields of America’s pastime. They are our ballparks and I have my five favs! My disclaimer is of course that Yankee Stadium is my favorite ballpark because it is home to the best team in the world- The New York Yankees. So outside of Yankee Stadium, there are my “other” favorites who are forever in my head, give me chills and make me happy to be a baseball fan. The ivy-filled outfield, roof top views and daytime games make Wrigley Field a unique place to watch a game. The last time the Cubs were in the World Series was 1945, but fans far and wide continue to fill the ballpark every season, believing that the curse of the goat will be broken and the Cubbies will win the Series. 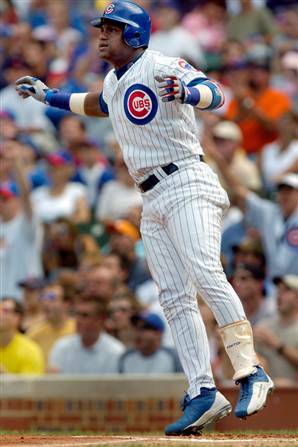 Wrigley has always been a “friendly to hitters ballpark”, particularly to sluggers Ernie Banks who hit 512 homers with the Cubs and of course Sammy Sosa who slammed 60 or more homeruns in three different seasons. What’s special? The Cubs fly a flag on the center field scoreboard after each game- white means the Cubs won and blue means they lost. 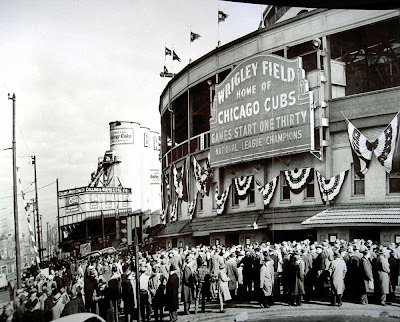 And until August 8, 1988, Wrigley Field only hosted day games because the lights were never installed following the Japanese attack on Pearl Harbor. The then owner donated the money earmarked for the stadium lights to the war effort. Wrigley Field is vintage as the second oldest ballpark in baseball and it is must see for baseball fans. The statues memorializing the best Oriole players of all time, the village like atmosphere and the proximity of the seats to the action on the field make Camden Yards an incredible experience for fans old and young. The greatest moment at Camden Yards has to be September 6, 1995 when Cal Ripken, Jr. played his 2131 consecutive game breaking the Iron Horse, Lou Gehrig’s all-time record. Screaming Earl Weaver still echoes the walls of the beautiful ballpark, a monument to the greats of the game in Jim Palmer, Frank Robinson and I will even throw in our very own broadcaster Ken Singleton. 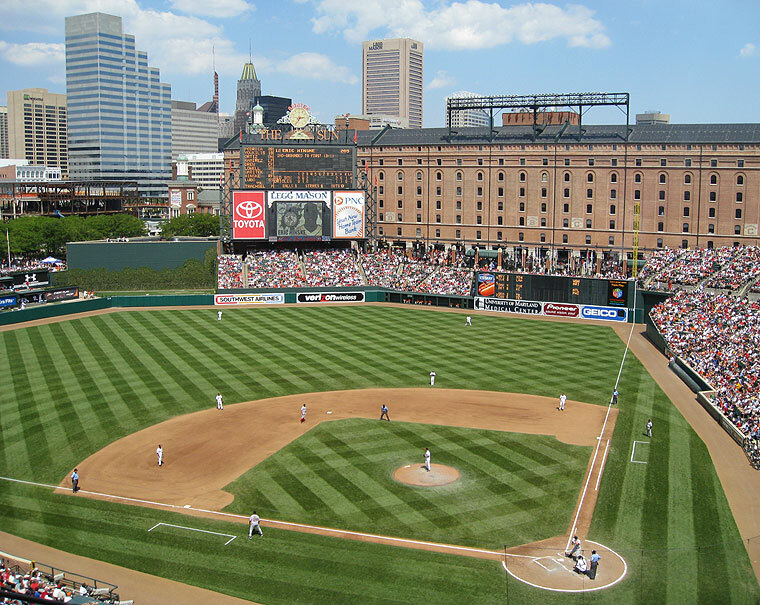 Camden Yards quickly became the template for the construction of the new ballparks built over the last twenty years including our very own Yankee Stadium. You feel like you are on the field, in the middle of the action, with the way the seats are positioned. And a Natty Boh brew is never far away with the bars and pubs affixed around the interior of the ballpark. 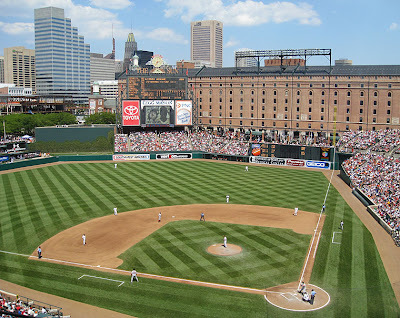 Oriole Park at Camden Yards, a fun place to watch a game and tie one on with friends. Even though I relished the visit I made to Three Rivers Stadium back in the late 90s, PNC Park in Pittsburgh is absolutely beautiful with the bridges and rivers in the outfield and the city skyline overseeing the architecture of the ballpark. PNC Park is a great stop on fans’ ballpark tours across the country. The irregularly shaped field immortalizes its most famous player, Roberto Clemente with an outfield wall that rises up 21 feet behind right field. 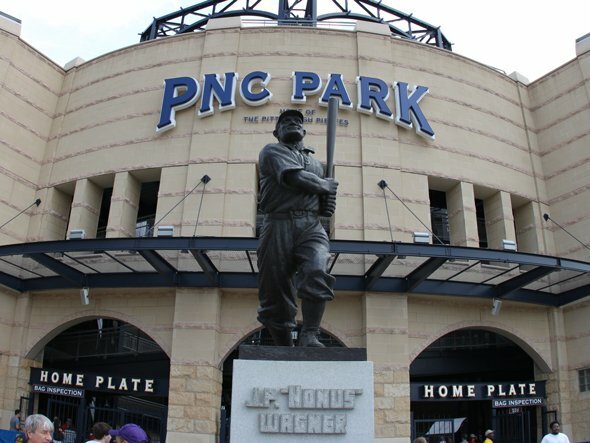 The urban-based venue welcomes pedestrians walking to the ballpark from the Clemente Bridge, which is closed to vehicular traffic on game days. It is also a very intimate ballpark with the highest seat just 88 feet from the field giving every fan a great view of the action. I have always wanted to go this park. 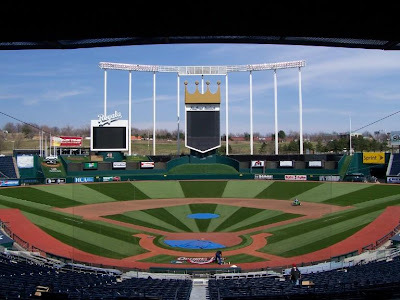 I really don’t know why because so many people complain about it, but I have to say, I have always been attracted to the fountains in the outfield, the crown scoreboard in center field and just the team itself who really gave us a run for our money in the seventies and eighties. 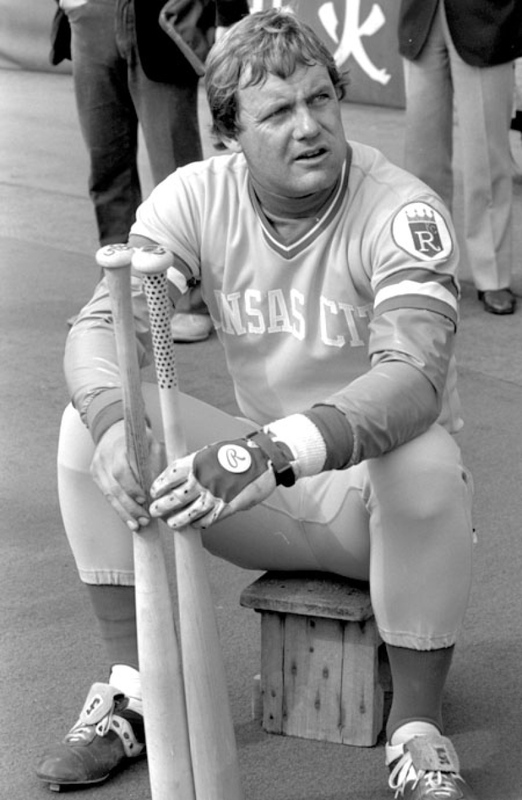 I am a George Brett fan- there I have said it. And I am still a George Brett fan following last year’s All Star Game hosted by Royals Stadium. There is something regal about the 40 year-old ballpark, it’s classy and clean from my vantage point- my living room couch, but truthfully, the newly integrated Outfield Experience gives fans new and exciting vantage points to view the game including new outfield box seats next to the vintage fountains and a trendy bar called the Miller Light Fountain Bar. The stadium outfield also has the popular Pepsi Porch and Sonic Slam standing room area nearby the fountains. It’s a party at Royals Stadium, with lots to see and experience. 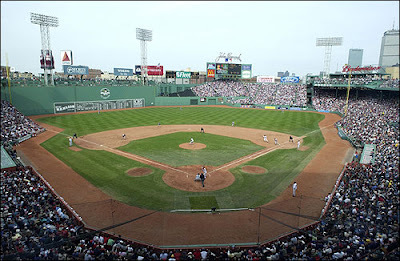 The only home of the Boston Red Sox, the oldest ball park in baseball and the most historic, most exhilarating place to watch a game. Fenway Park is in a word electric. 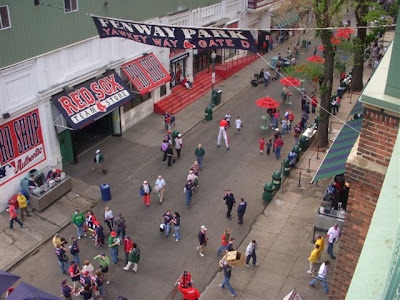 Even if you are not a Red Sox fan, like me, you can quickly become a Fenway fan when to step into the streets surrounding the vintage ball park. It’s a party in the streets every time the Sox are home as the vicinity around the stadium is closed off to non-gamers and ticket holders are greeted by turnstiles in the streets about an hour and half before game time. The sights and sounds of good ‘ol American baseball reign loud and clear in the streets of Yawkey and Ted Williams Way. The Ted Williams statue stands proudly behind the infamous Green Monster and the old ticket booths add to the charm of the ball field. 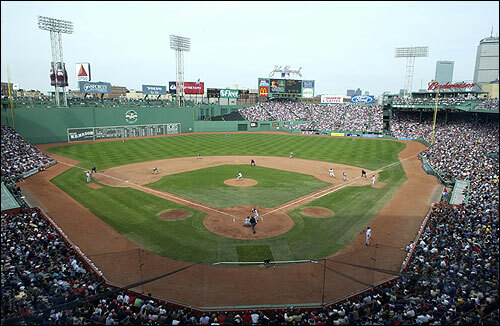 And if you are lucky enough to score tickets on the Monsta, you will see the most amazing view of the game in all of baseball. You may also spy the only red seat in the park- a dedication to Ted Williams’ last homerun in Fenway and bellow the eighth inning rendition of Sweet Caroline. Fenway is the place to be all summer long in Boston. So, that’s my five favs! I am sure you have your own favs- share them with us! Those creaky and shiny stadiums all have a story- and there is no better story than the ones you create with your family and friends at the ballpark. Whenever one of my kids wants to push my buttons, they'll ask for a drink or a snack and once I say, "One minute please", they'll sarcastically smirk at me and chant, "Do it, do it, do it, do it!" If I did that when I was a kid, I would have got the ring hand to the mouth. But I'm a dad who happens to be a ball buster with my kids... and they are to me as well. It's a give and take of comedy... sometimes there's a line. That dialog is usually a big joke in my house and unless I'm in a pretty bad mood, that's the only dialog that can cross it. 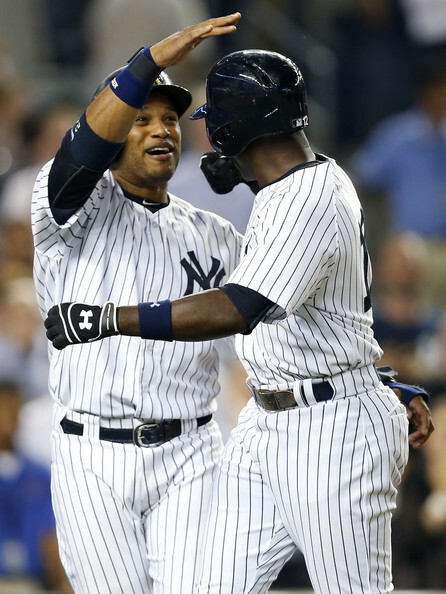 I'll tell you what isn't a joke though... the Yankees winning now in this homestand more than ever. They play the Orioles, no slouches and that is clear. Buck Showalter is a God... I think we all know that at this point, coming from an organization like the Yankees and moving on to now a division rival of the Yankees. The Orioles are believers. They believe in themselves and it's mostly because of Buck. Lucky them. We HAVE to believe too now though. We must believe. We must win... we, the mighty New York Yankees, have to beat the Orioles and everyone else in their path right now if they want a shot at making the playoffs. Now comes the chant, but it's not sarcastic this time... it's dead serious... Do it, do it, do it, do it! Tonight ladies and gentlemen, the Yankees started to do it... it was a big win and I'm proud of my club tonight. CC Sabathia went 5.2 innings tonight. He was NOT outstanding, but we've seen this all year from the big guy. He was having trouble and we almost lost the game because the Orioles just keep on coming. But CC is the master at figuring it out and while it almost slipped away... it didn't slip away. 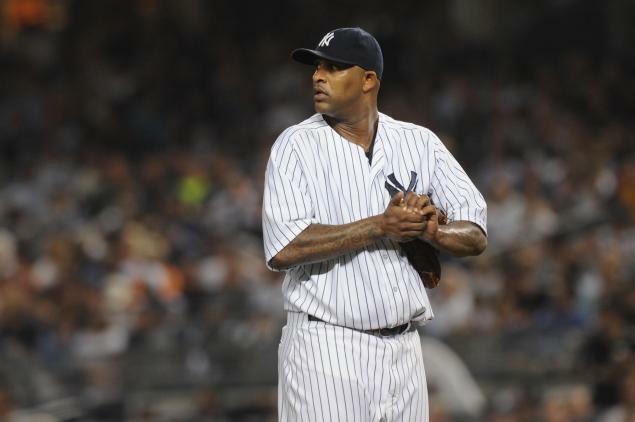 CC gave up 7 hits and 5 runs, striking out 4. Shawn Kelley, Boone Logan, DRob and Mariano Rivera followed. Only Kelley and Robertson each gave up 1 hit after CC. In other words, our pen did a damn good job holding down a tough Baltimore club. No easy task. In the 4th inning, Alfonso Soriano cranked out his 29th homer of the season. It was a 2 run homer and Cano scored. But it was the 5th inning that really broke things opened for New York because the Yankees were down at that point. Mark Reynolds doubled, knocking in Curtis Granderson. After that, Ichiro Suzuki knocked a 2 run home run. Later, Robinson Cano singled knocking in 2 more. In the bottom of the 7th, Alex Rodriguez singled and knocked in Cano. I felt like Cano was in every play tonight, I swear. And the irony of the "love of Alex Rodriguez" is laughable. Every Yankee fan hated the guy, but he gets a hit and RBI and we are instantly in love with him again. My friend Jenny raised that question on Twitter tonight and it rings true.... if you hate the guy, hate him. Don't contradict yourself and love him when he's producing. Hey look, it's an interesting take, and this is a recap, NOT an analysis piece on ARod, but hey, it makes sense. Think about it. 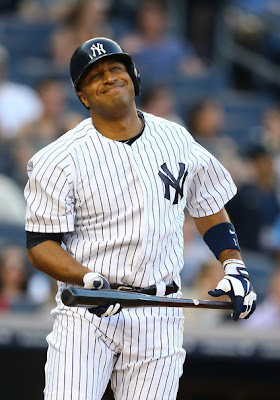 Whatever the case, it was that ARod RBI that really provided alittle insurance against a tough Orioles team. I'm glad for that and I'm thrilled that the Yankees were able to hold the Orioles and work together, pitching AND hitting at the same time.... that's baseball. Chris Stewart has filled in admirably behind the plate for the New York Yankees, but with the team making one last desperate run at a playoff spot; it is Austin Romine that gives the Bombers their best threat at catcher. When the season opened, Francisco Cervelli was the Yankees primary backstop and Stewart was his backup. 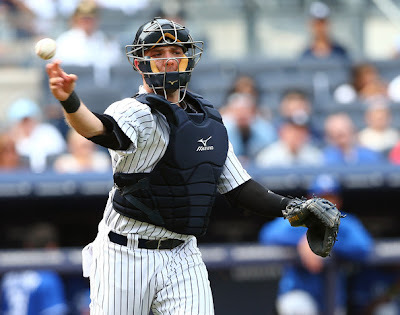 Once Cervelli fell to injury, the team placed all of the catching responsibilities on Stewart’s shoulders. 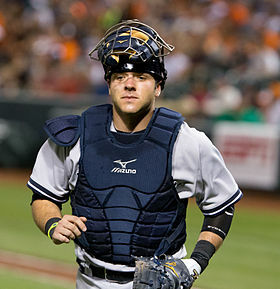 Austin Romine was called up but his hitting clearly wasn’t ready for significant playing time at the big league level. Stewart had never been a full-time catcher, but was known for being a solid defensive-minded signal caller behind the plate. Through the first three months of the season he even held his own as a hitter; batting .263. Since July it is a different story, as the 31-year-old has hit just .174 over the last two months. In the meantime, Romine has done a complete turnabout. He struggled through the first three months, hitting .145 through June 29th. It’s almost as if Stewart said “tag, you’re it” on July 1st. Since then, the 25-year-old is hitting .321 and has displayed a gun for an arm behind the plate. 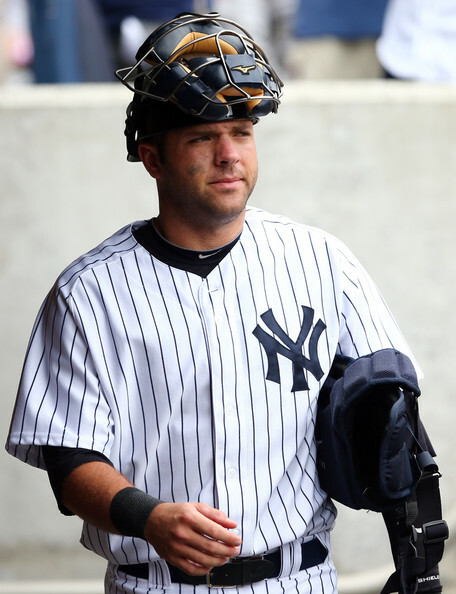 With runners in scoring position, Romine is hitting .269 while Stewart ranks near the bottom of the team at .224. 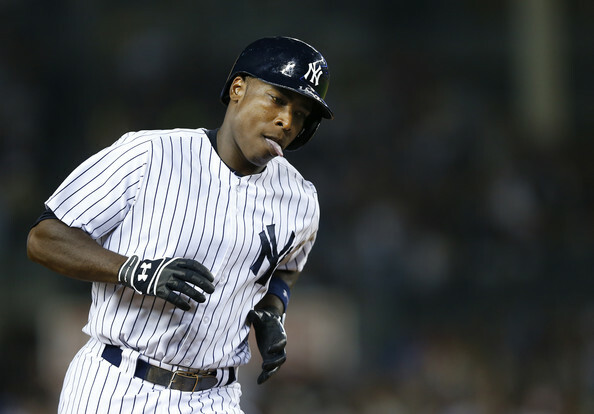 The Yankees have now reached their most critical point in the season. Sitting 5 ½ games out of a playoff spot with 29 games remaining means that every game is basically a playoff game. Every day the Bombers need to field the nine players who best give them an opportunity to win. There is no room for failure. 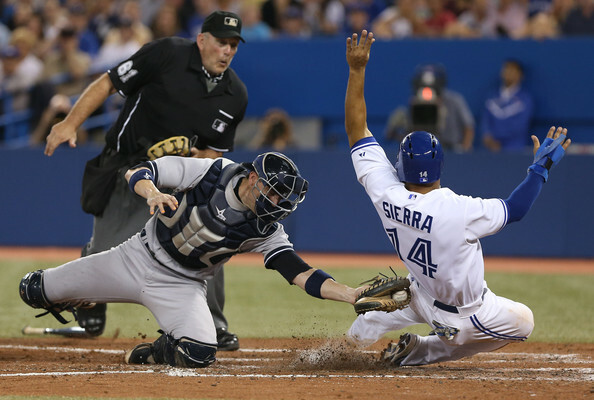 With 17 games remaining against the teams that sit ahead of them in the AL East, the club still controls its fate. The stretch run officially begins with a three-game set against the Orioles on Aug 30th. If manager Joe Girardi wants to have his best lineup for the final month, he has to make Austin Romine his primary catcher. Any loyalties to a veteran player or token starts as a way of saying “thanks for holding down the fort” that might be directed to Stewart need to be set aside for the time being. We need a pedal-to-the-metal mentality. Put the blinders on, give the binder full of situational statistics to the Salvation Army or the Kidney Foundation, and simply put your best available players at each position around the diamond. That means put Austin Romine behind the plate and leave him there. YANKEE DESPERATION OR THE WAVE OF THE FUTURE? Paul Pabst isn't a 12 year old girl, so I guess Instagram has evolved since the last time I checked it out. 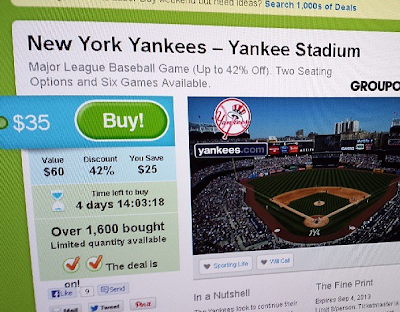 I found it weird that the Yankees would be using Groupon. Not sure if Paul has an opinion on it, I guess he just wanted to share it. In turn, I wanted to share it with our Bleeding Yankee Blue audience and get your opinion... What do you think? By the way, if you don't listen or watch the Dan Patrick show... you're missing out. It is by far the best sports show ever. Dan and the boys do a great job. Here are some past posts about it. Just when you thought you knew all the Yankee farm hands, another kid raises the bar. Now, I know Greg Bird, but many of you don't. We first mentioned him when the Yankees signed him. Read THE YANKEES & DRAFT SIGNINGS from back in 2011. Based on our friendship with Dante Bichette Jr, we probably overshadowed Bird. It doesn't erase the fact that he's awesome, he's developing abd he had a good season and, according to the Charleston Riverdogs, he's been selected for the South Atlantic League All-Star team. 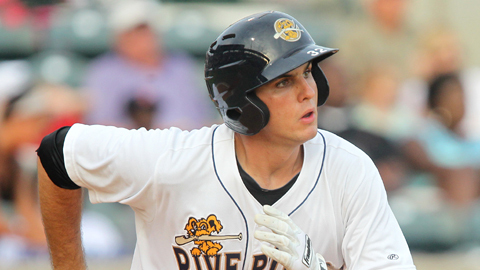 According to Sean Houston at the "Dogs", "Bird, who leads the RiverDogs with 20 home runs and 83 RBI, has been named to the 2013 South Atlantic League All-Star Team, which for the first time in league history includes a spot for a relief pitcher. The group was voted on by the 14 South Atlantic League team’s field managers, general managers, sportswriters and broadcasters for a total of 56 votes. 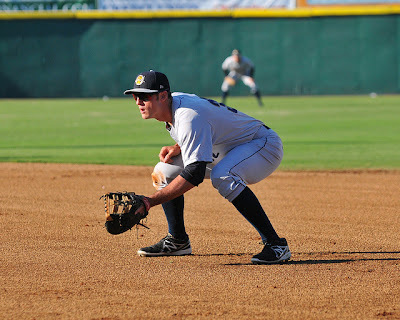 A 6’3”, 215 pound lefty slugger from Aurora, Col., Bird has had one of the most impressive seasons for a first baseman in quite some time in the South Atlantic League. He leads Charleston in almost every offensive category with a .289 batting average, 20 homers, 83 RBI, and 129 hits. Bird also leads the entire South Atlantic League with a very impressive 100 walks, 59 extra base hits, and .423 on-base percentage." We love the kids... Ty Hensley, Dante Bichette, Tyler Austin, Cito Culver, Mason Williams, Rob Segedin... the list goes on and on. We're happy to celebrate when these kids do big things... after all this is our Yankee future. Congrats on a good season Greg, Good Luck! This season, it's been fun and heart warming to watch the "Mariano Rivera farewell tour." 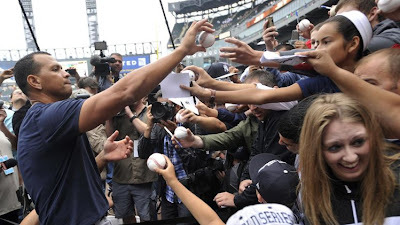 Ball clubs are making it a point to remind Mo that he is a a baseball icon and a legend, and greatly respected, by giving him extremely creative, and interesting gifts. BYB wrote about the gift that the Rays bestowed on him HERE for instance. I started thinking about all the generous gifts he has received, and picking my favorites among the bunch. All of the gifts have some sort of meaning, and these teams have all been kind to Mo. Honestly, Mo was probably a thorn in the side of many of these teams. 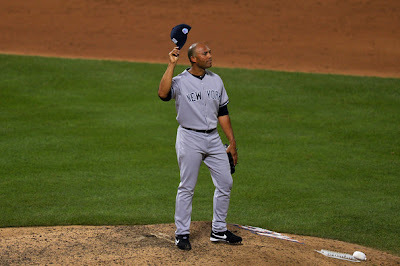 It can't be fun knowing that you will face a closer like Mariano Rivera. I would probably get butterflies in my stomach if I had to hit against him. So each gift has been amazing in their own right, and I'm sure our humble Mo appreciates them all. 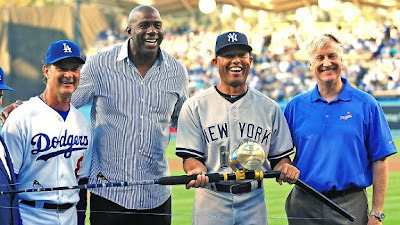 One of the gifts that made me tear up was the fishing rod the Dodgers presented Mo with. It shows that they paid attention and that they respect his humble beginnings, and want to honor that. Remembering where you came from is important. It's part of the story of who you are, and what made you that person. The fishing rod, to me, was incredibly monumental, and a deep show of respect. 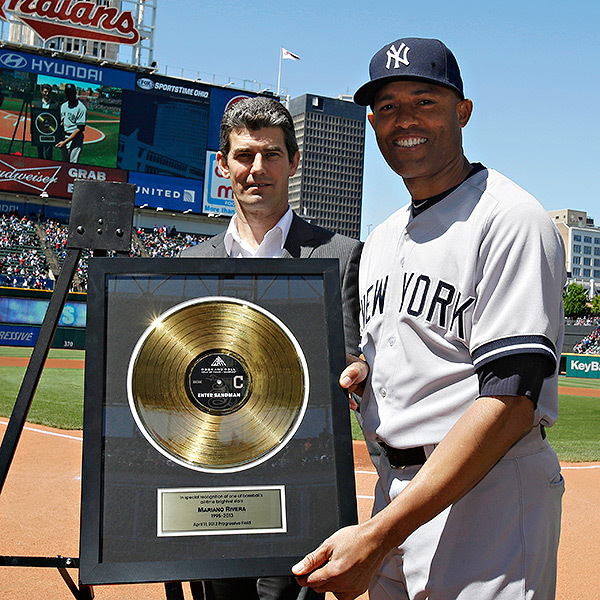 The Mariano Rivera Foundation's mission is to help children in impoverished communities. 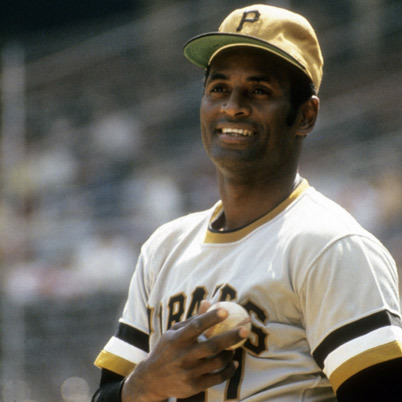 Mo played baseball in Panama using milk cartons as gloves, and rocks as baseballs. So they fact that he and his wife, Clara, want to give back is no surprise. So this one is great. The Rockies have donated to his foundation and that makes me smile. 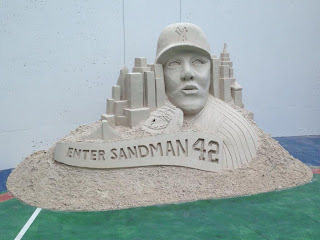 And that sand sculpture of Mo that the Rays gave him? That was only part of the gift. While the sand sculpture will be on display during the series, the real gift was the donation they made to his foundation too! I should also note that there are a few other teams that have donated as well. Kudos to all teams that donated. It is by far one of the most beautiful gestures from one human being to another. 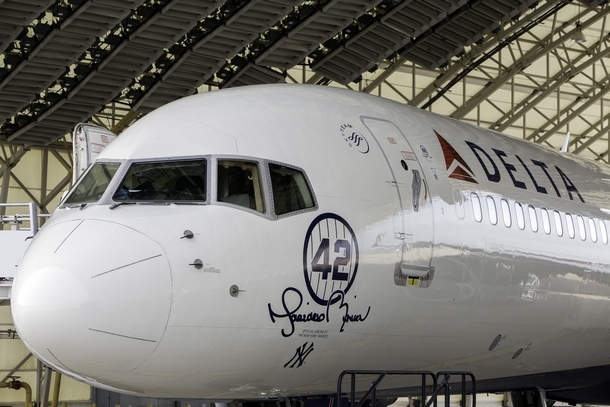 Let's just talk for a moment about how cool this thing is... Delta, the official airline of the New York Yankees, were not going to be left behind. They wanted to let Mo know how well respected, and liked he was. So what did they do? 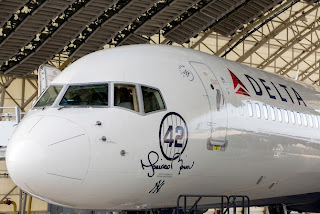 They put his name on a 757! Like, seriously Delta? Way to set the bar! Geesh! Oh, those clever Twins! The "Chair of Broken Dreams," is probably one of the more creative gifts he has received this season. And the name? Let's face it, Mo has probably broken a lot of dreams closing out games over the years. And can't you just picture Mo years from now, sitting on his porch in that chair, with his grandchildren around him, telling them all his baseball stories? Maybe sipping on a lemonade, for visualization purposes. So most people have to sing at least a note or two before they get a gold record. Mo? Nope! Mo just comes out in the 9th inning, to Metallica blaring through the speakers, and BOOM! The Indians make it happen. The gold record of Metallica's "Enter Sandman" is plain awesome! The song has changed because of Mo. Granted, it is an excellent song in it's own right, but because Mo has used it as is entrance, it has taken on new meaning. Mo IS the sandman! He has put teams to sleep. Major props to the Indians for this. Hey, it makes me glad to see that teams around the league have as much respect for Mo, as Yankee fans do. It just shows what kind of ball player he is. He is a living legend. The kind of guy that you look at your grandchildren years from now, and express your deep hero envy. 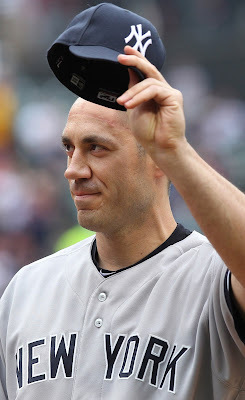 So from this Yankee fan, to each team, and fans of other teams, thank you for loving Mo. Now you see what we've appreciated all these years... he's our guy, now and forever. 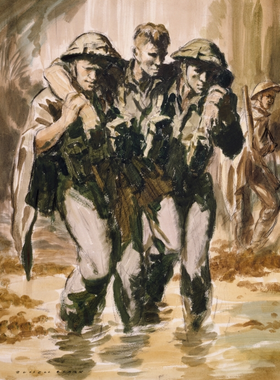 I'm not taking the "walking wounded" title and a picture of soldiers above lightly just so you know. I am merely drawing a comparison to soldiers and athletes and their want and need to be on a battlefield and when hurt, they hopefully recover to their fullest only to go play, or fight, again. Hope people got it. There are still quite a few Yankees that are hurt and I just wanted to fill you in on a few of them. 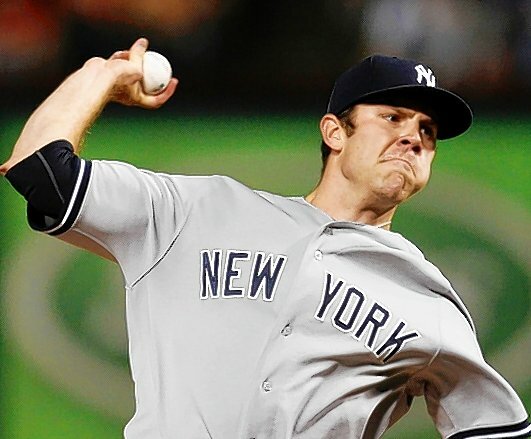 David Phelps: You remember him right? It’s been a while. Well, the latest is you can forget about him coming back this season...seriously. He has that forearm strain, read HERE and he has not even started playing catch yet since the injury. Look, this is an obvious decision to make. We don’t need the guy right now. He’s young. So just fix him up and have him ready for Spring Training in 2014. Forget about Phelps right now. Travis Hafner: Pronk is hitting off a tee. 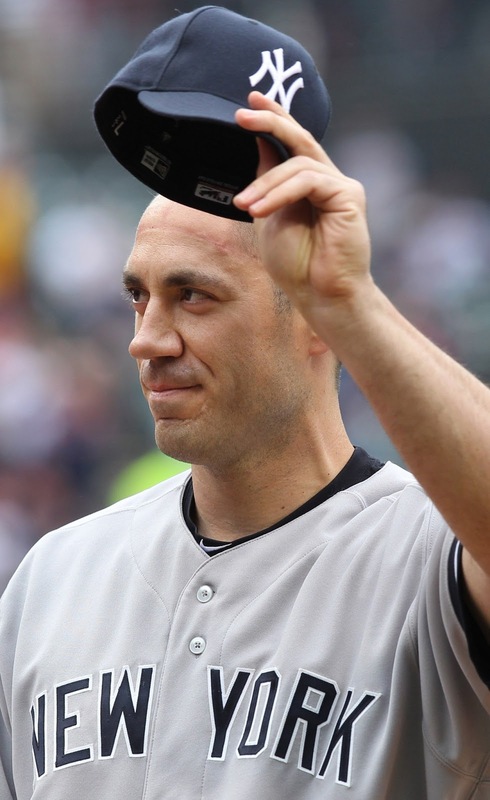 But seriously, with everyone we now have, especially with the addition of Alfonso Soriano and Mark Reynolds, and even lefty hitting Curtis Granderson back... kiss Pronk goodbye. Remember, he hurt his shoulder and was shut down most of the year. He had a good, short run with us, but things just didn’t work out. No hard feelings, right Pronk? Look, he could come back this September, but where is he going to go? 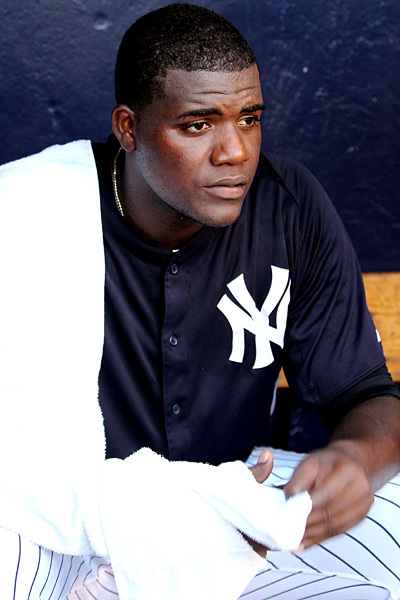 Michael Pineda: Oh boy. He was close and then the Yankees shut him down, read HERE. Well, the latest is he’s throwing, but not in a simulated game or anything. 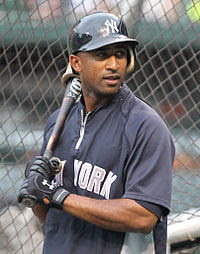 Another situation where the Yankees just need to get him back for Spring Training 2014 and chalk up 2013 as a loss. Look, it could be worse, we could have a sucky rookie catcher with a PEDs suspension by the name of Jesus Montero right now, huh? Pineda will be back… just not this year. Eduardo Nunez: He’s day to day after that recent right knee injury. I will tell you something though… this guy gets hurt way too much. Nunez will be better in a day or 2. No worries we will see him again. 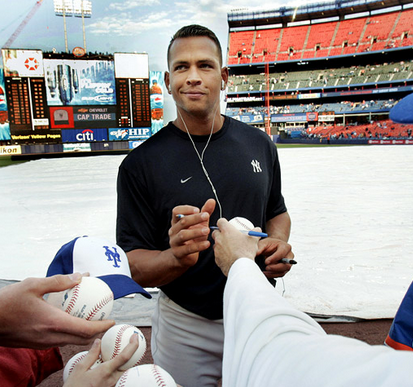 Whenever we hear the name "Alex Rodriguez" or "ARod" usually the first reaction is "Oh, God. What now with Alex?" It's true that any news that surfaces daily involving Alex gets everyones attention and we are all tuned in for it. Whether you love Alex or dislike him, you are as curious as the next person. It reminds of the Jim Carrey movie The Truman Show. Where it's all about one man's life and his story is part of our daily lives as Yankees and baseball fans alike. We watch closely awaiting for an exciting conclusion. The only difference is that Alex is aware he is on live. Truman Burbank had no idea he was a living script. This is the world of Alex Rodriguez and everyday is a new chapter, and we the people are the audience! 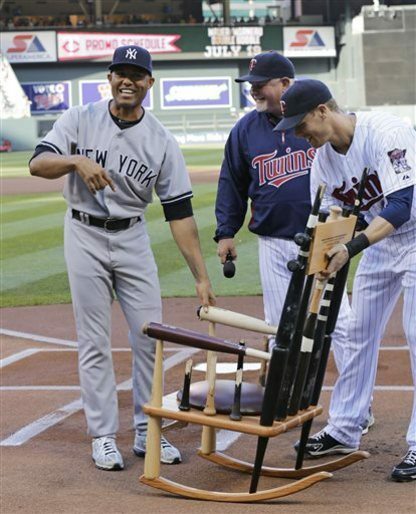 Sure there are ARod sympathizers. By that, I don't mean they deny him of any wrongdoing. No, they just view him as a human being who made a mistake. They are willing to forgive and forget. Alex gets love from them and he gives it back with autographs and pictures and all that good stuff that comes with meeting a well known athlete. They want him to go out there and help the team get back in the race. The team is 13-10 since Aug. 5th when Alex returned in Chicago. His presence is making a difference. Then there are Alex defectors, who see him as the team cancer, and see his reputation as irreparable and tarnished for as long as baseball exists. No matter how hot Alex gets, he is the villain, disgracing the pinstripes and the tradition and preservation of the Yankee legends. To them Alex's name does not belong in the same sentence as Mantle, Maris, Gerhig, and even with Jeter. They get love back from Alex. How? He is deafened to the jeers and heckling at every ballpark by just going out there and tuning it out. Make no mistake Alex hears it, he's not ignoring it. They even want a picture of him just to say "Look at this, I was this close and got this shot of him." All for bragging rights, because everyone wants to be involved somehow. But in the end, those who defy him are just as inquisitive to know what the guy is doing in his daily life. I said it back in a previous BYB piece. 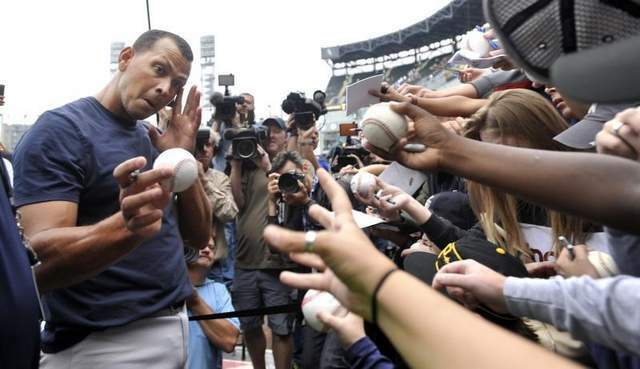 POOR AROD, DOES HIS RETURN MEAN ANYTHING? I want Alex to help out, however... which way? It seems that a few are catching onto it. Not all, just a few. It's how I felt all along. I am just like all of you looking for any ARod nugget the media will write up. Why? Because all eyes are on Alex, and yes, it IS interesting. Alex knows it too. No matter what he does or where he is, Alex knows he will always have an audience. So, don't miss the next episode of What will Alex Do Next? I know I'm waiting for it. Are you? ANOTHER AMAZING YANKEE TRIBUTE VIDEO YOU MUST SEE! Yesterday I posted a video by a guy named Justin Glick who made a Tribute to the Yankees video on YouTube and it was awesome! (except for the odd clip of Willie Mays making his famous catch as a member of the New York Giants.) Other than that... It was glorious! And with Glick's video came another that I found and I absolutely love as well! This one comes from a person named Ling Bon and I want you to check it out and tell us what you think. Hey, it even featured Nick Swisher's famous pounding of the chest in Boston! We need to believe right now in our New York Yankees. We need to believe now in our Yankee history and believe in the team we put on the field! 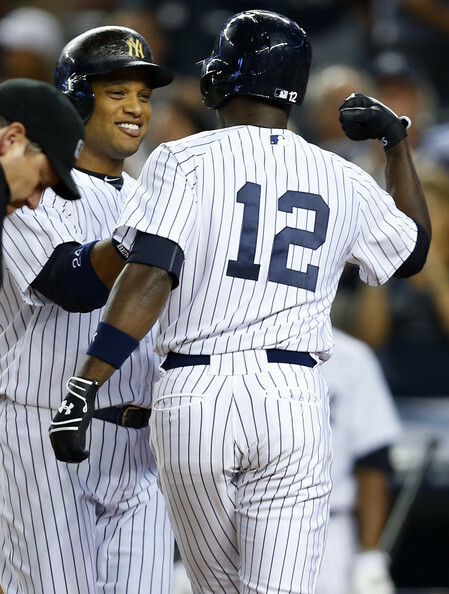 These are our New York Yankees. These are the guys we believe in, and they know that... let's give them that fan reaction they need to keep them going every night! Let's give them that support they need! 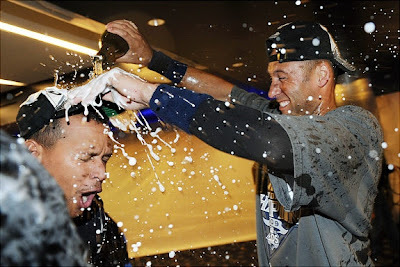 Check this video out and share this post by Bleeding Yankee Blue! Let's continue to pass the torch of greatness!